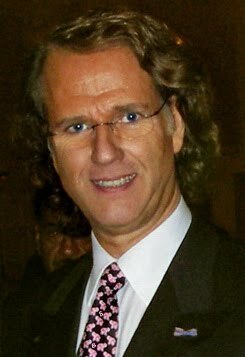 Happy 60th Birthday André Rieu!! 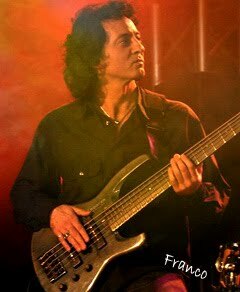 Happy '60th' Birthday André From ALL Your Fans Around The World! 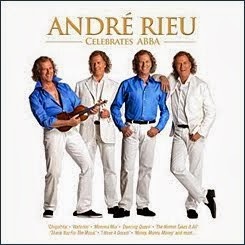 Here's Everyone's Chance To Add Your "HAPPY BIRTHDAY" Wishes on Here to André!! 32 Comments ~ write your Comment here! 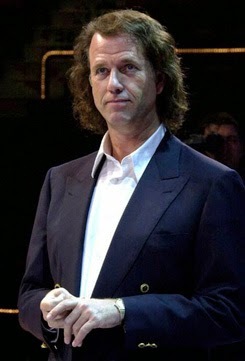 AMSTERDAM (Reuters) - André Rieu can be seen next month on large screens. 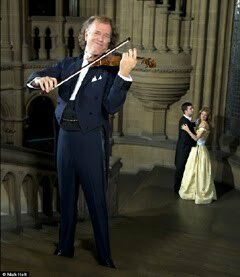 The concert of the world famous violinist and orchestra on October 16 in Sydney, can be viewed in five Australian Pathé cinemas. That is what the cinema chain announced Tuesday. 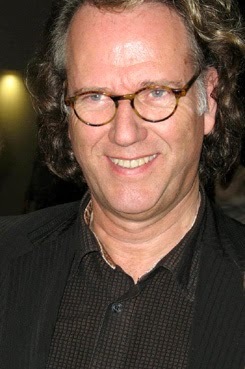 The October 16 concert will be shown live in the Pathé cinema in Rotterdam. 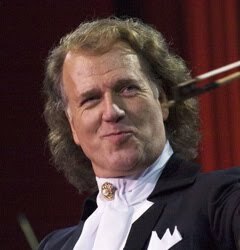 The performances of Rieu and his Johann Strauss Orchestra can also be viewed entirely on other days in cinemas in Amsterdam, Den Haag, Groningen and Eindhoven. 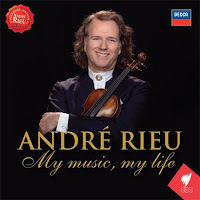 The Rieu concert on October 16th in the Acer Arena in Sydney has already been sold out. The musician is touring through Australia and New Zealand from 15 October through 1 November ... Thank You to Kees for sending this and John Translating it for us. *Note that CD 'One' is the exact same tracklist as his "You'll Never Walk Alone" CD ........ Thanks to Mike in Australia for sending this to us. 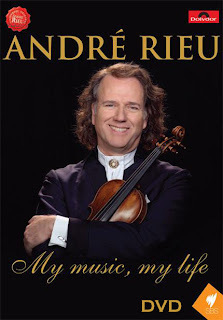 New André Rieu DVD "My Music My Life"
André Rieu DVD "My Music My Life"
How do you make dreams come true? 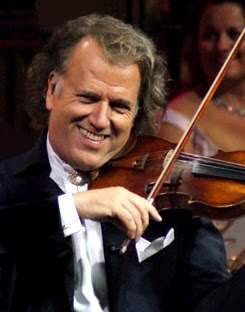 This new revealing documentary delves into the life and achievements of master musician, violinist and entertainer extraordinaire, André Rieu. 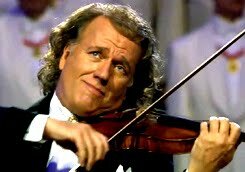 This new revealing documentary takes violinist André Rieu’s achievements to a new level as he brings Vienna to the world. 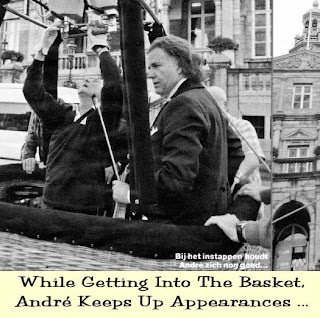 Relive his chart history in Holland and take a tour around André's castle in Maastricht. Marvel as a replica of Schönbrunn Castle is transported around the globe and built in 40 seconds! 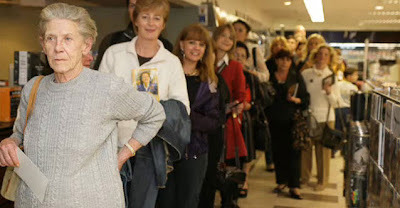 Meet his fans in his new land of adoption, Australia. 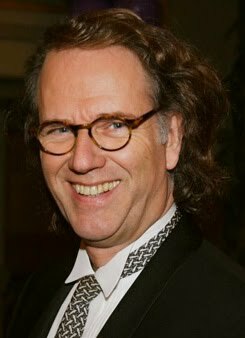 Dutch TV personality Ivo Niehe invites you to share with him the world of the incredible man and musician that is André Rieu. 14. And after all this …? Thanks to Mike in Australia for sending this to us. Aljona, Robin and Rieu The Magical Olympic Gold Formula? With the Football Anthem our Dream Skating Pair is reaching for Gold ... "You'll Never Walk Alone", the great English football song, now echoes even through the ice arena. 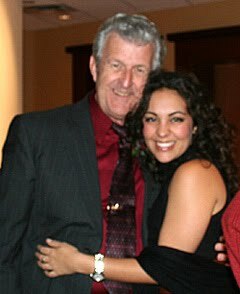 Our Dream Pair, Aljona Savchenko (25) and Robin Szolkowy (29) are aiming for Gold at the Vancouver, Canada Olympics ~ February 12 thru 28, 2010 with this football classic! On Friday at 10:47 PM, the Pairs Skating Champions revealed their secret in Oberstdorf Kuer. 2000 spectators euphorically enjoyed the world premiere and the Victory of the Nebelhorn Trophy was never in question. For their "Golden Project" Aljona & Robin brought a world star on board. 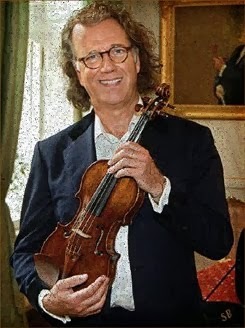 'Star violinist André Rieu' arranged "You will Never Walk Alone " and recorded this new piece with his orchestra in Maastricht (Holland) last July. Rieu: "It is an honor for me to support Aljona and Robin." Aljona, Robin and Rieu ~ The Magical Formula for Olympic Gold? Aljona: "I like this piece really well. But lots of work awaits us. The transition of the elements have to go much smoother." "You'll Never Walk Alone" is a show tune from the 1945 Rodgers and Hammerstein musical, Carousel. 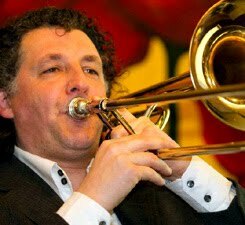 The song is also sung at football clubs around the world, where it is performed by a massed chorus of supporters on match day; this tradition began at Liverpool FC in the early 1960's and later spread to several other clubs. Thank you to John for ©Translating this for us! 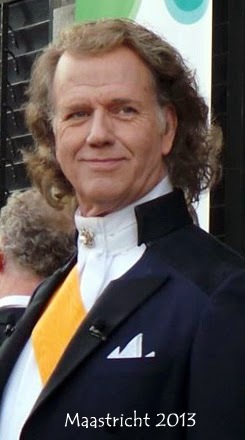 Violin virtuoso André Rieu plays a guest role in the drama "Flikken Maastricht". 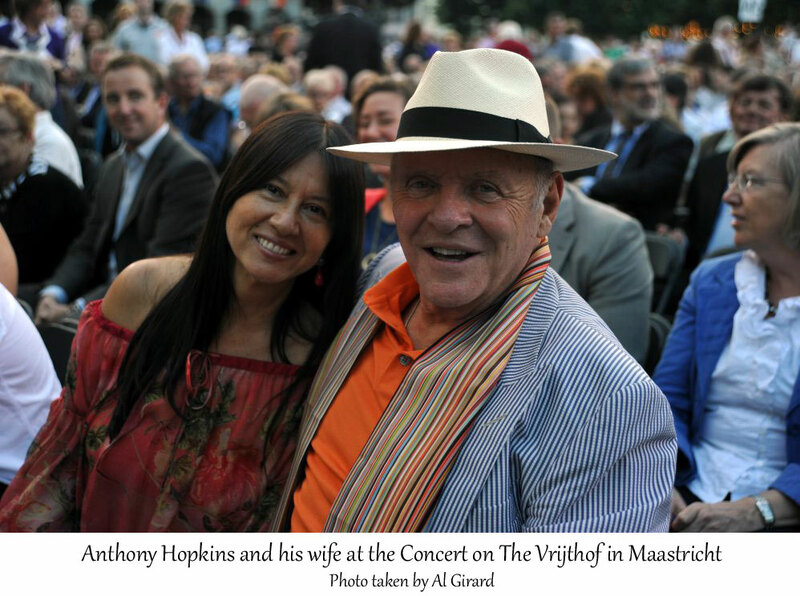 The recordings take place at his concerts on the Vrijthof in Maastricht last July. 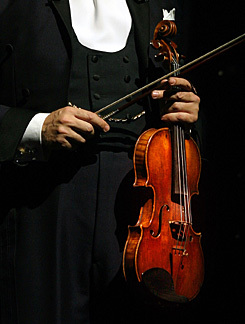 In the episode Rieu plays himself and the investigators need to pull out all the stops to thwart an attack on him. 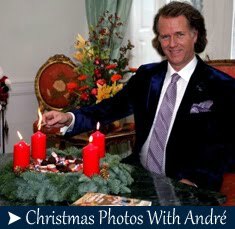 André Rieu Performing TWO Christmas Concerts Arnhem! 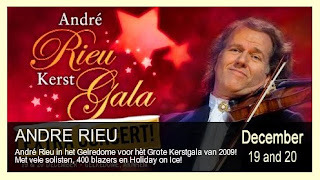 André Rieu will now appear on Saturday December19 and also on Sunday December 20, in the Gelredome for his Great Christmas Gala 2009! 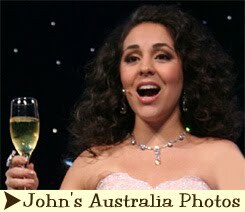 It promises again to be a spectacular evening with impressive scenery and light show, sensational waltzes, classical music, operettas and musicals ....... 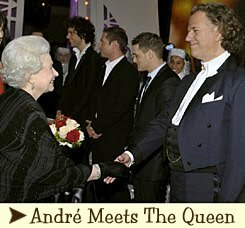 Enjoy the unique appearances of André's soloists, Carmen, Carla, Mirusia and the Platin Tenors. A huge ice rink with top skaters from "Holiday on Ice" And if that is not enough, a spectacular and unforgettable performance by no less than 400 brass players who will definitely bring on the goose bumps. Thanks to John For Finding and Translating this! 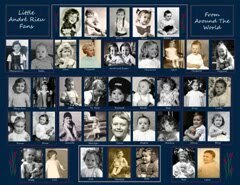 Thank You to Marg and Margaret for sending this to us. THE world's biggest entertainers will soon perform at a cinema near you. 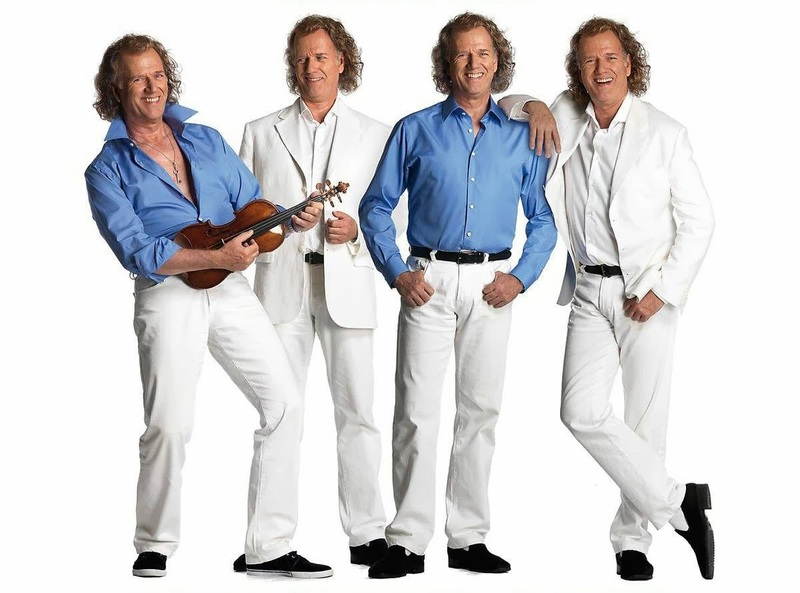 Classical maestro André Rieu is the first major international act to take his Acer Arena extravaganza into more than 50 theatres via satellite on October 16. CinemaLive trialled the innovative concept of putting live music on about 35 big screens with The Wiggles Christmas concert in December last year. It was so successful, the concert was then re-broadcast in 40 cinemas in the UK in January -- with Santa's segment cleverly re-edited. A raft of big-name artists who are touring Australia in the next six months are on CinemaLive's wishlist including John Farnham, Fleetwood Mac, AC/DC and Keith Urban. Unlike American tours, a lot of the artists don't have the opportunity to get to all the major regional areas of Australia, so this is one way their concert can go everywhere," CinemaLive's Michelle Hunter said. 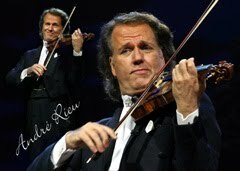 Rieu has already SOLD OUT two Acer Arenas with only a handful of tickets left to his third show. Tickets to the arena shows start from $89 while the cinema screening will cost $40. Cinema Live will screen the show in High Definition in local Cinemas throughout the country. 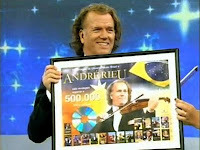 André Rieu on Brazilian Television Show! It's best to watch these in order. 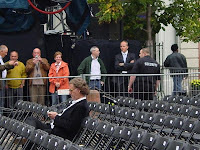 The first one is of André Back Stage waiting to enter. 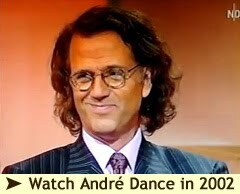 Then the second link is to André as he's On Stage at the Television Show. 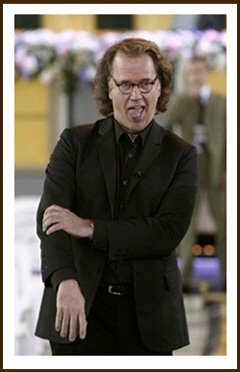 "How André Rieu Combines Sound (music) and Color"
The atmosphere in André Rieu's 'Open Air' concert on the Kornmarkt was impressive. 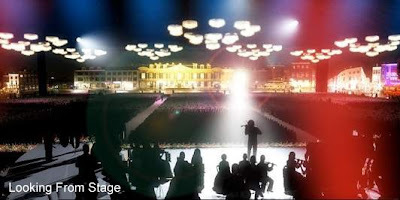 What the lighting technician of ZDF brought out of Heidelberg's most beautiful buildings and places, would be a good example for the lighting concept of the city. It can be seen on TV on October 14th. The Trees, the Facades, and even the Castle and the Holy Spirit Church were immersed in brand new, bright lights. 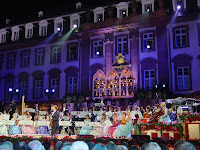 With every song, the Kornmarkt became a very special, bright, multicolored magical place whenever the king of the waltz and his Johann Strauss Orchestra and soloists played. 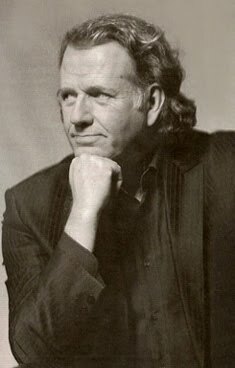 The Dutchman is an excellent stage professional and no wonder, after being on the road for 30 years with his musicians. 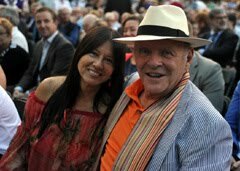 He claims that it still gives him joy: "Music is the most beautiful thing we have in life," he explained to his audience in Heidelberg. Those who had traveled from far away, paid a lot of money for seats and when left at the end had a feeling, "That it was worth it." It was an event that will not only bring Heidelberg's name to the German speaking countries, but also to Asia and the United States. A treat for marketing. 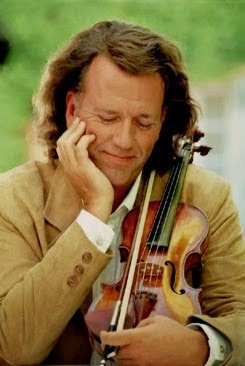 When André Rieu puts his violin to his chin, his fans know his smile, mischievous ~ relaxed ~ misty eyed ~ blissful ~ there is no need for interpretation. 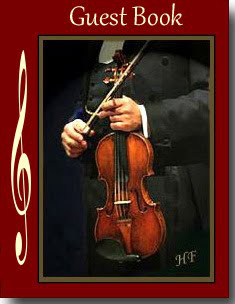 But one thing is certain, the radiant faces of the musicians ~ you can not find that in any other orchestra in the world. 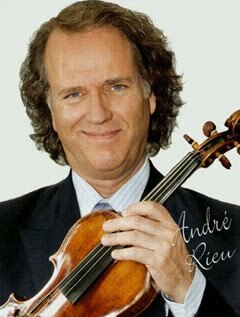 Rieu sees it is his goal to spread a good mood with humor, and to bring the classics to the people. This time he makes it very much about Heidelberg. 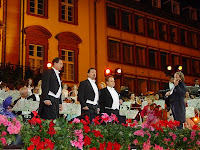 Immediately after the peppy overture from "Carmen" comes the "Heidelberg Anthem", "The Lost Heart" to which the audience immediately starts to sing along . 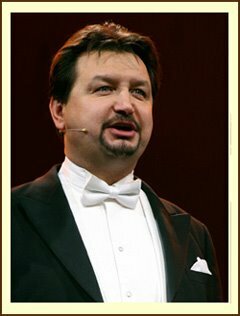 The three "Platin Tenors" from Australia, Hungary and Germany set the mood with students songs like "Drink, drink, drink" from the "Student Prince" and "Gaudeamus Digitur". 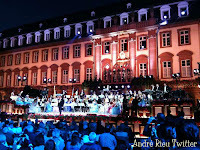 During Franz Lehar's "Gold and Silver Waltz" the entire Kornmarkt was immersed in gold. 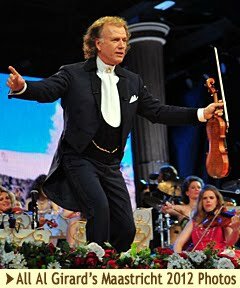 Since Rieu discovered that the Viennese Waltzes played during the times of father and son Johann Strauss and Franz Lehar, which created so much joy for the people at their balls and festivals, he made them his trademark and the success of this proves him right. Boredom does not exist at his concert. 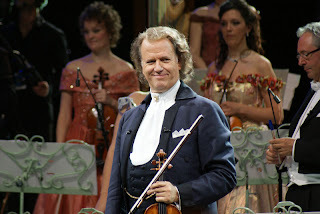 Rieu interacts with his audience and sometimes makes a little joke at the expense of the Dutch, which is well received. 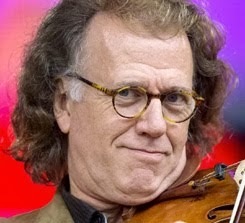 He flirts with the audience just like he does with his blond violinists. The audience laughs happily and is moved to waltz ... not just the paying guests, but also the onlookers behind the fences. 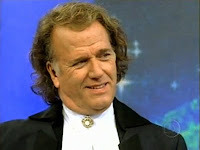 André Rieu has of course also brought singers. 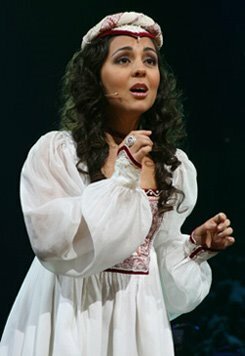 The Brazilian soprano Carla sings the "Juliska from Budapest" and Mirusia from Australia, with her beautiful soprano voice sings a rousing "Two little Italians," as well as the melancholy "There Is a Song Within Me". 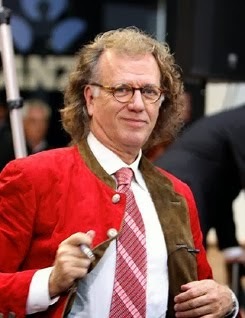 And then Andre Rieu proves that his audience can sing the lyrics of the "Lorelei" and "Sah ein Knab ein Roeselein stehen," (A little boy saw a rose bud). 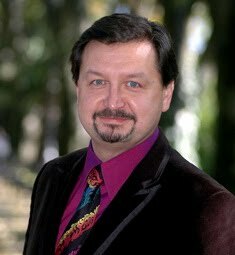 The "Comedian Harmonists" cannot fill the big shoes of their famous role models from the twenties, so it is probably good that the suave gentlemen are not singing a cappella, but have the orchestra backing them. 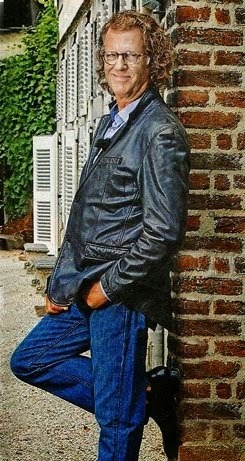 Thank you to John for the ©Translation and Iris for the ©Photos! 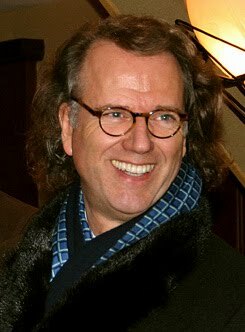 Ruud and I traveled about seven hours by tram, train and taxi from our home in The Hague, the Netherlands, to our hotel in Heidelberg, Germany (in the district of Baden). 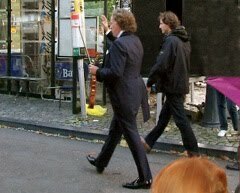 We passed through Cologne, where we'll attend the New Years concert on January 1st 2010. We had to change trains three times, but the German High Speed Trains are very comfortable, so it was a joy to travel with beautiful sunny Autumn weather and beautiful landscapes outside. From Beate: Right after work yesterday I went down to Heidelberg. I strolled through the streets and hoped to catch a glance of the rehearsals. 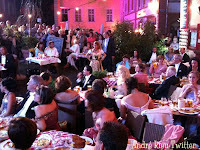 When I arrived at the “Kornmarkt” , the crew was still busy building up and decorating the stage. 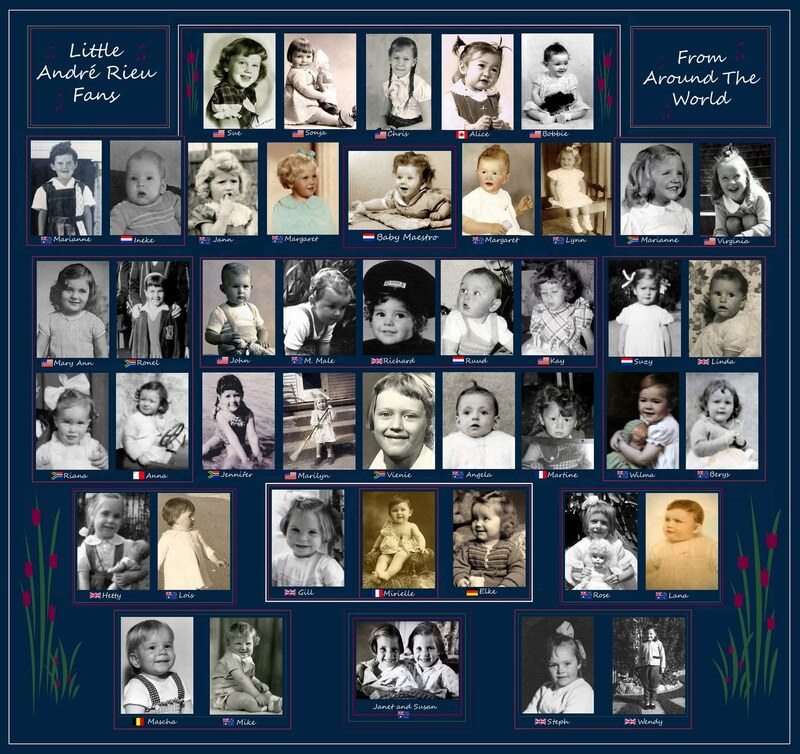 I discovered Iris and Albert Schilling and Helma Kindler ( you might know them from the Fandinner in Maastricht) across the place. I went down and had a nice chat with them. 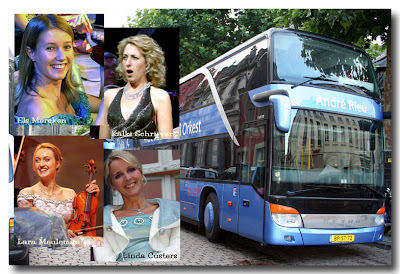 When the Rieu buses race through the wide landscapes of the USA to the next concert hall, Els Mercken (32), Kalki Schrijvers (32), Lara Meuleman (30) and Linda Custers (35) don't lay lazily around watching a movie or taking a nap. No, they are engrossed in their study books. Before they started on their courses with the OU, their bus was full of chatter and laughter. "We were the party bus. Now we are the study bus". 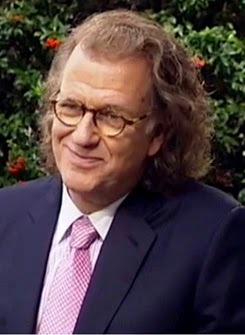 A few months out of the year, they travel with André Rieu and approximately 55 other musicians around all the continents to conduct concerts in large venues or mega open air concerts. We do not have a nine-to-five job. The lack of regularity is just the spice in our lives. Since Linda got the spirit, an intellectual wind is blowing through the orchestra. More JSO members, primarily the ladies, have plans to follow courses with the OU, which is an institution that offers courses at a distance. 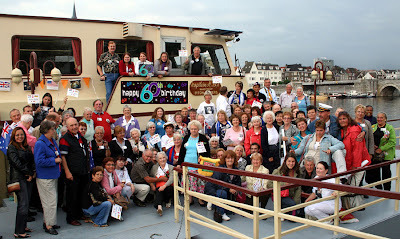 The JSO members travel several months a year around the world. They perform in big halls or in open air concerts. "We don't have a 9 to 5 job." 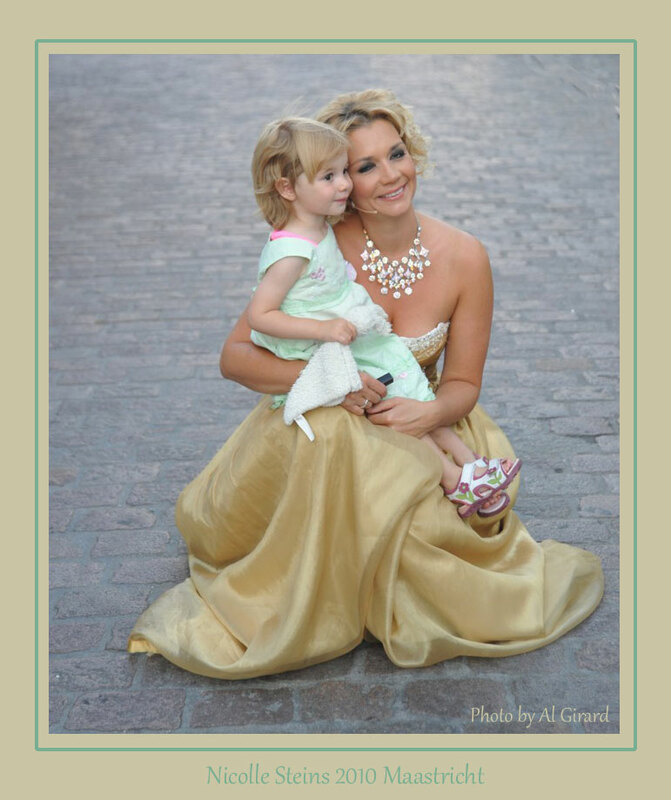 It was hard to find a date for the interview and the photo shooting. Since the JSO is often abroad. "30% of our time we are on tour. 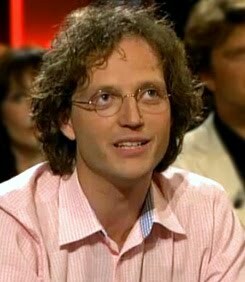 That's our job", laughs Kalki Schrijvers (singer). "We talk about a Germany tour, an Austria tour, a France tour. We have even been in the USA three times this year. Australia and New Zealand are in the agenda for the fall. 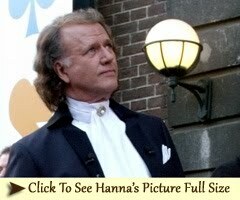 But the end of August we are in Holland again, in Heerenveen. 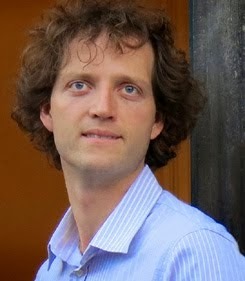 In June the orchestra was at home in Maastricht. 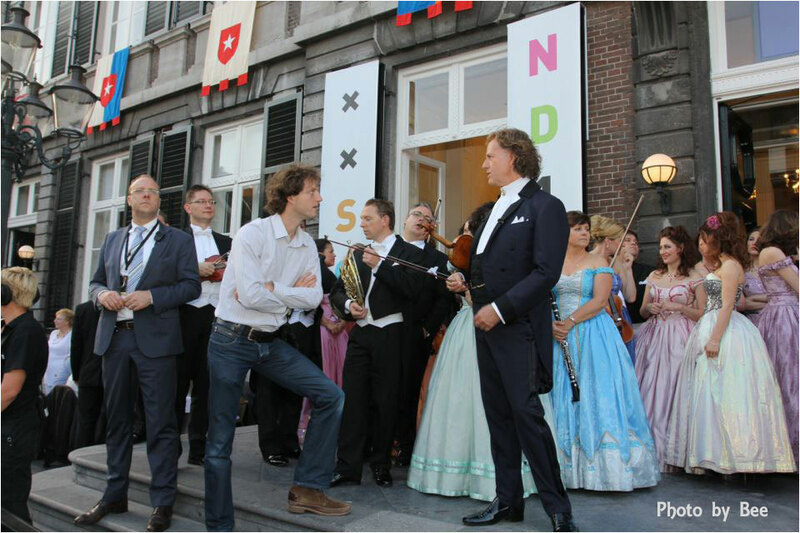 They had to rehearse for the Vrijthof Square concerts. In the morning they rehearse, in the afternoon they have time enough for the interview. 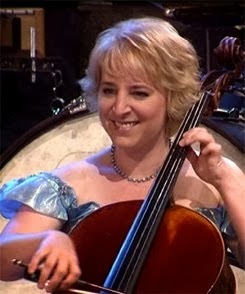 If there would not have been an interview, Linda Custers (viola) knew what else to do, study! In October last year she started as a pastime; the course, Culture Science, which became a real passion. Her enthusiasm was catching. Kalki joined her, also in Culture Science. 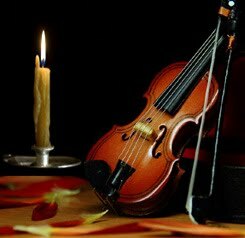 Lara Meuleman (violin) ordered a free orientation course and in the meantime had already obtained the basis module of Psychology. 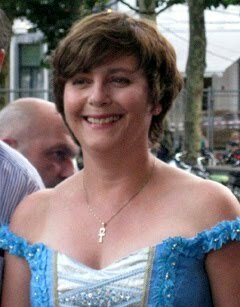 Els Mercken (violin) started with Management Science and she successfully passed the first exam. They are not studying to improve their positions in the job market. "No, not at all. 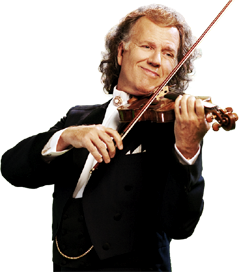 As long as André Rieu continues we'll join the orchestra. We wanted to do something useful while touring. We spend many hours in the bus and also in the mornings there is time to study". Linda was always interested in Culture. Together with Kalki they attended lots of museums abroad. "Now we walk through a museum with more knowledge". 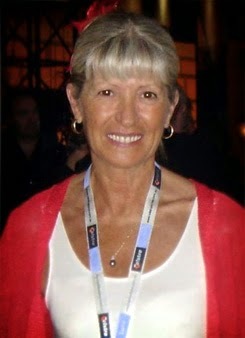 Linda preferred education without required colleges and work placement. After searching the internet, she discovered the Open University, and that was exactly what she wanted. liked the psychological side best, that's why she now chose Psychology. 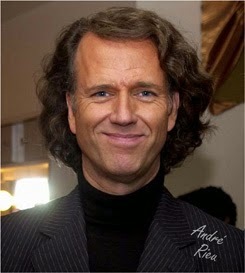 September 17, 2009 ~ André Rieu will not reveal the program for his two concerts on Friday and Saturday. 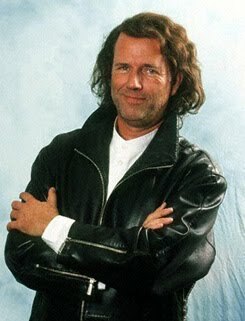 But he has learned an extra "I've lost my heart in Heidelberg", the song that gives the TV recording it's title and makes every Heidelberg citizen beam with pride. 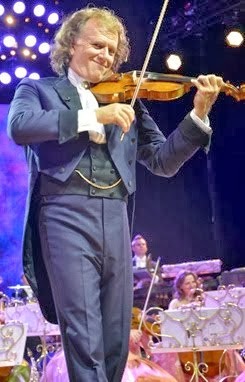 "A concert with a lot of Heidelberg," the violin star promised the journalists yesterday. "And of course you can expect a lot of Waltzes". 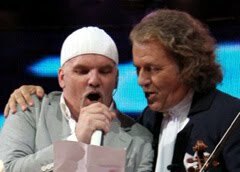 The Dutchman wants to make this concert on the Kornmarkt, as always, a "happening" for his fans. 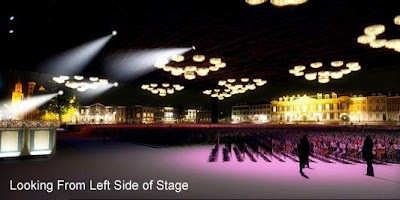 For two nights an audience of 850 each will find a place in front of the stage; tickets were sold out immediately. 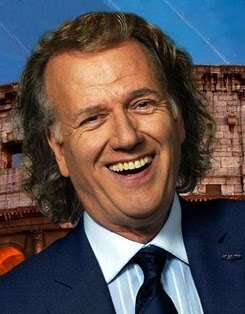 André Rieu envisions that his fans will also be in the streets surrounding City Hall and be listening to his music, just like what he first experienced in the small town of Tuscany. 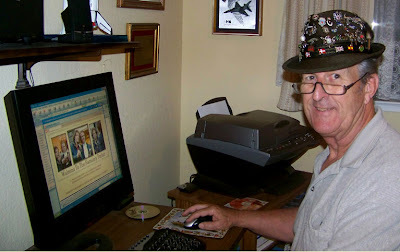 The Germans, he knows, belong to his "oldest" fans. 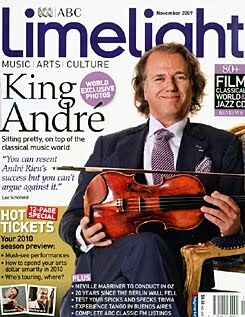 And probably will enjoy his music for many more years: "It can last a long time." 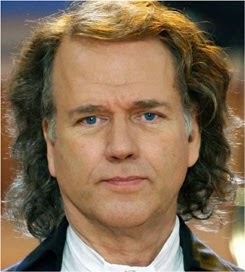 The Kornmarkt is actually much too small for the big André Rieu. 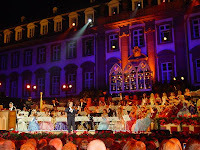 Looking at everything however, said Horst von Estorff, director of the Concert project, it is wonderful there ~ the castle, the entire atmosphere. 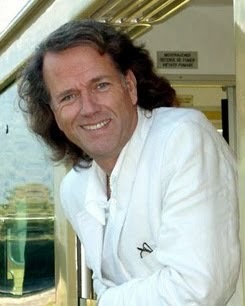 The backdrop for André Rieu and his 75 musicians will be the Heidelberg Town Hall. 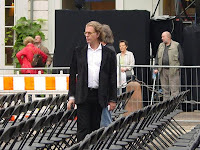 The artist, says Estorff, wanted to go by himself in May from the Karlsplatz to the Uniplatz, to search for an ideal place for his orchestra. He stopped at the Kornmarkt: "That's it ..." With this picture Heidelberg had won out over Berlin and the Brandenburg Gate ~ which was to be the alternate for the TV recording. Or Las Vegas. Or Sydney. 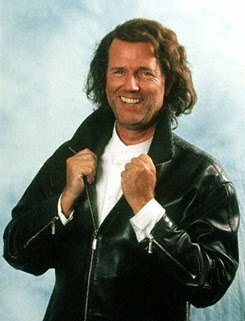 The only one bad thing in Germany said Rieu smiling: "Is that on the squares of the cities you find fountains or sculptures." And that is really nothing for his great public events. 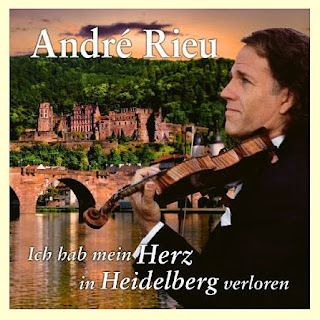 The cuddly violinist likes Heidelberg. He has been here for two days now making pre-recordings for the 90-minute program, which will be aired as a TV special on 14 October by ZDF and also in Austria and Switzerland, and will be made available to be viewed by 80 million people in Asia and the United States. 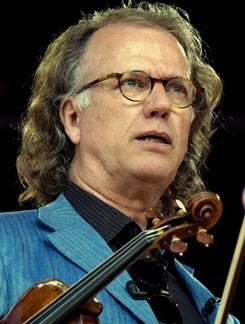 "We want to show Heidelberg's most beautiful sides," says Rieu, who made recordings yesterday in the pedestrian areas and small alleys with a Fiat Cinquecento . "The students have it good here," he says, comparing Heidelberg with his birth city of Maastricht. 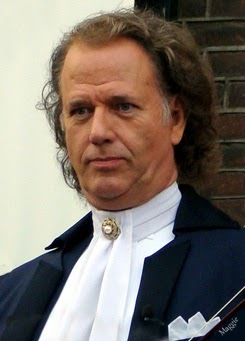 Lord Mayor Eckart Wuerzner agrees, but Maastricht is an example for Heidelberg, when it comes to bringing the city to the river. 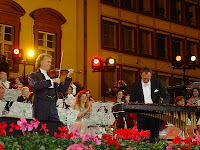 In general, the mayor is thrilled that the world famous violinist, who played in front of 500,000 spectators and earned 60 million euros last year, wants to bring a message to the world, which reads: "Heidelberg is even more beautiful than one could imagine." For this event the city is doing everything. It closed the entire Kornmarkt, and the event also closed the Charles Street to the Chambers Street and the Bremeneckgasse to the Burgweg. From Thursday evening to Sunday evening, the old city center will not be accessible, and even the pedestrians will have to avoid the Corn Market. The underground parking garage exits will be one way and bus lines 30 and 33 are diverted. Even the conference room of the City Council will be used for a few days as a dressing room, equipment storage and rehearsal space. 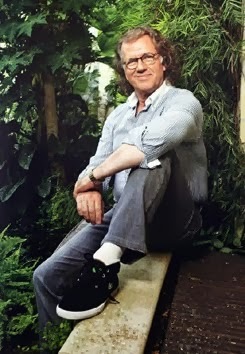 And Here is Another Small Article that Ineke Sent That John Did For Us. 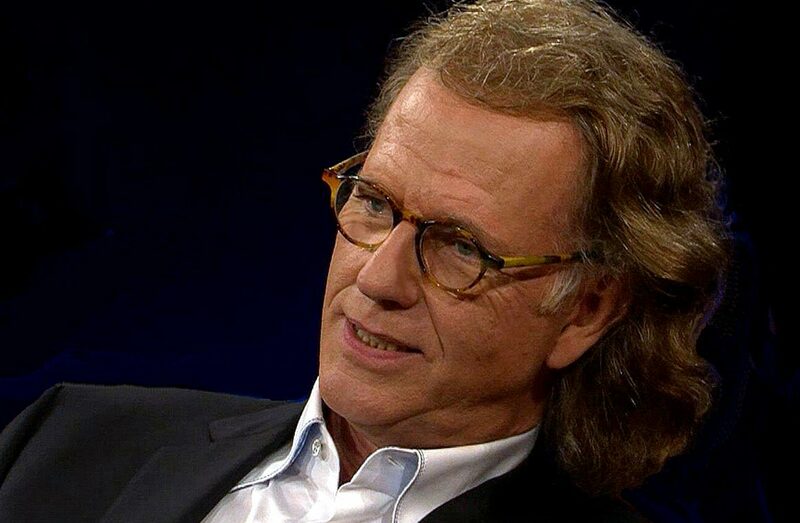 "Waltz King" André Rieu would rather have his annual open-air concert in Heidelberg then at the Brandenburg Gate in Berlin. "For the last three years I have told him that there is no suitable place here" explained project manager Horst von Estorff on Wednesday in Heidelberg. 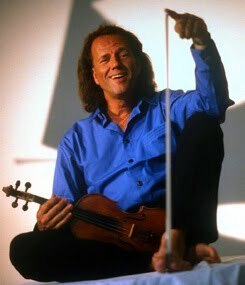 But Rieu pushed on - and is thrilled. 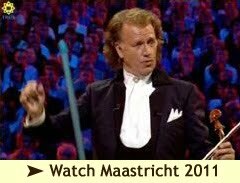 "I feel like I am at home in Maastricht," said the Dutch violinist. "Everywhere the small, romantic streets - the students are really having it good here," said the 59-year-old enthusiastically. 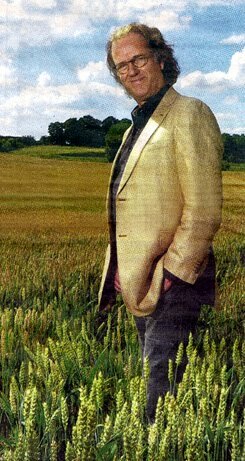 The preparations for his concert however, are immense. Since last week modifications are being made for the concerts, including taking down flag poles and removing bollards. 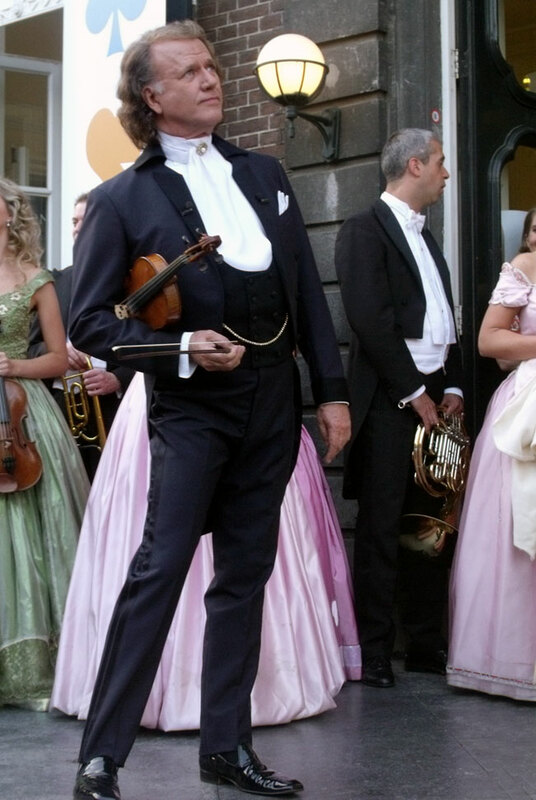 This Friday and Saturday Rieu and his 50-member strong Johann Strauss Orchestra will be in the old town of Heidelberg to give two concerts, which will be recorded as a TV special titled "I lost my heart in Heidelberg" and televised in October, by ZDF, ORF and the Swiss television network. The concerts are sold out. At the very least it affords you the chance to listen in the neighboring streets. 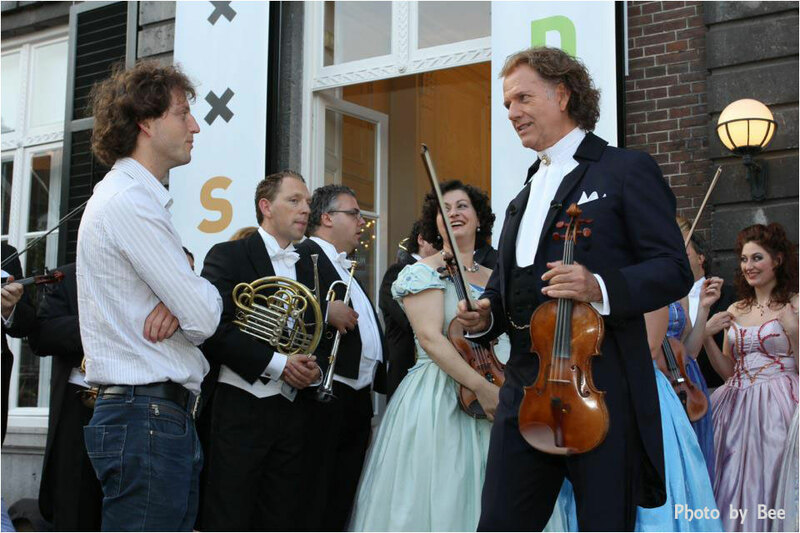 Inclusive the musicians, Rieu and about 180 employees are guests in the University City. Looking up Heidelberg I found this information interesting: Heidelberg may be one of the most popular tourist destinations in Germany. Small enough to feel like a "village" but big enough to be a city, Heidelberg has a population of 140,000. Surrounding the City are suburbs housing many American Army personnel and one out of every 7 residents of Heidelberg is a US citizen.The University of Heidelberg is the oldest continuously operatiing University in Germany. With 27,000 students. 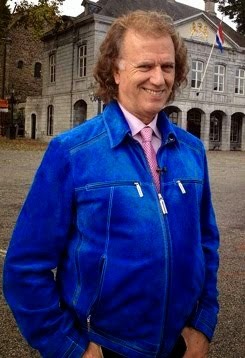 André Rieu's Scary Moments During Balloon Trip! 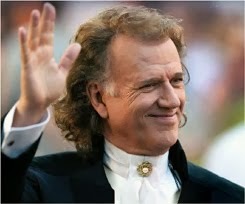 ANDRÉ RIEU SAYS, "I HAVE NEVER BEEN SO SCARED." 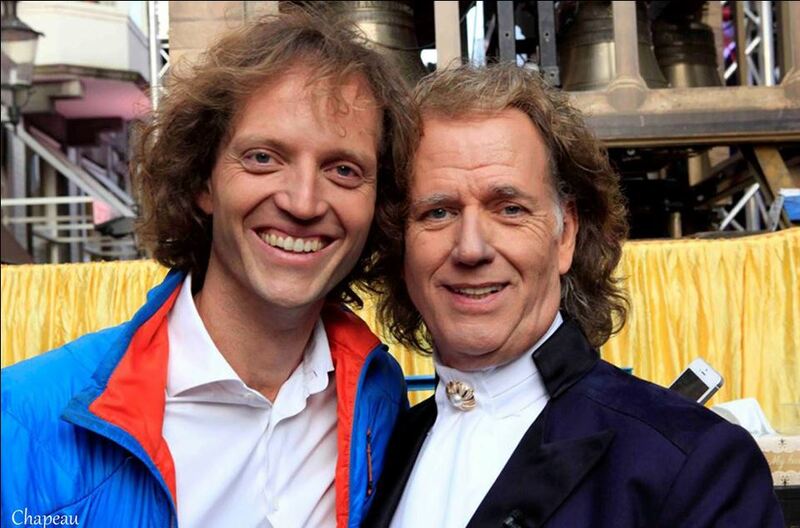 It was supposed to be one of the most beautiful experiences of André Rieu's life. 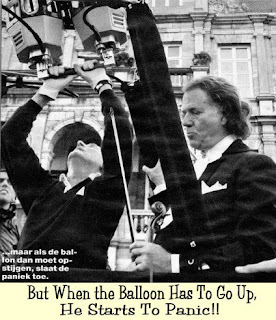 High up in a hot air balloon over his beloved home town of Maastricht. But the balloon trip turned out to be a disaster. André was too scared to go higher then 3 metres (approx. 10 feet) and even at that small height he broke out in a sweat. 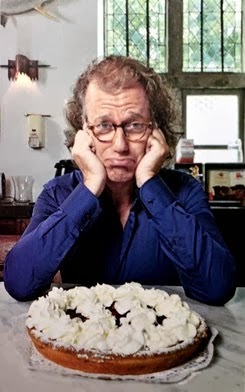 He takes everything on: the tours all over the world, his concerts for millions of people, the building of Schonbrunn Castle, he has met the biggest names on earth. 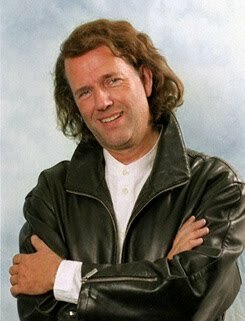 Not long ago he told us about his dream to have a concert on the moon. As a child he was already very interested in the Universe and wants to learn more about it one day. 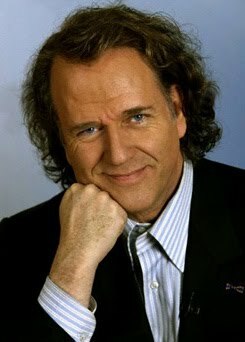 He has promised himself to live to be 120, so they will have the technology to go there and go down in the history books: Rieu the first man with a Concert On The Moon. 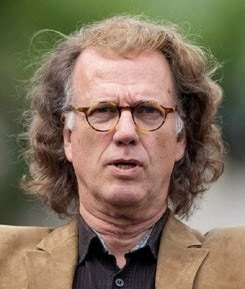 His wife Marjorie is afraid to fly and does not travel with André very often, but André travels all the time, even in Holland, by plane or by helicopter to avoid traffic jams. You would think he does not know what fear is but, as it turned out that does not really seem the case. kick in. 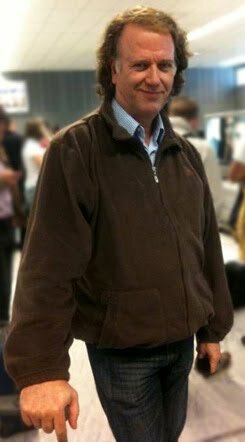 "I have fear of heights and that fear won and made me not go ahead with the balloon flight which would have been a wonderful experience but unfortunately it was not to be". "I have never experienced so much fear. In a plane that fear is a lot less but going up and coming down in it I never look out of the window either". It will be a while yet before the commercial of the Lottery will be broadcasted. 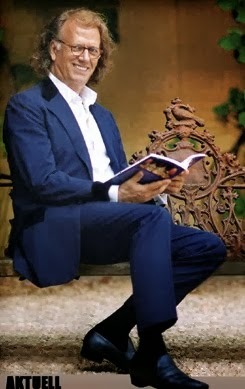 Our thanks to Berna for supplying the Article and Translation. Click on the link below to read Riet's story of the concert this month in the Amsterdam ArenA, along with the many photos she took. UPDATE On: ►Elsa White's Story of Maastricht's Liberation Elsa Hanöver (White) is certain, "My father built your first violin. 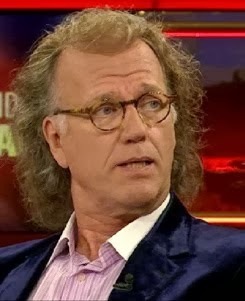 He was the owner of the music store in Maastricht", she tells André Rieu. 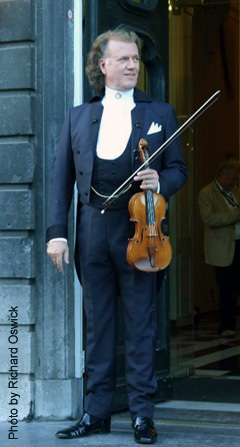 Even without this knowledge the violinist and orchestra leader admits that he loved the “blackmail" by this 87 year old lady. 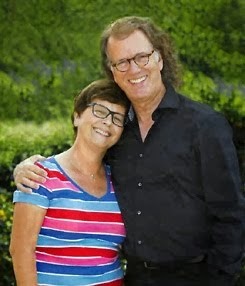 She wrote Mayor Leers informing him that she was wanting to travel to Maastricht to partake in the 65 years celebration of the liberation, under one condition: that she could meet André Rieu. 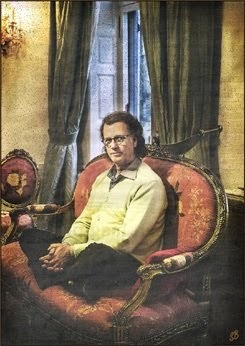 Rieu interrupted his Concert Tour in Germany to host a luncheon with the veterans in his Castle. 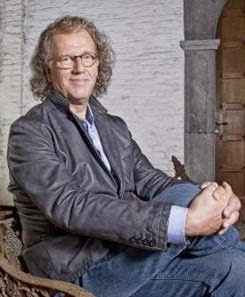 This weekend a book about Hanöver was released: "Else Hanöver, War years in Maastricht". During the war (1940-1945) she was a secretary to Nazi Party Member and Mayor Peeters and she passed all municipal secrets on to his predecessor Michiels van Kessenich. During the liberation time she showed the Americans "suspected buildings", since she knew where explosives were stored. That's how several bombs were disarmed. The resident of Florida (Hanöver) established a deep friendship with the first American liberator Wilson White. After the war they kept in contact and married 38 years later. Regretfully White did not live to see the release of her book. 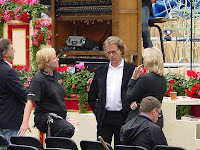 Hanöver is very proud of the book, but views André Rieu as the highlight of her visit. 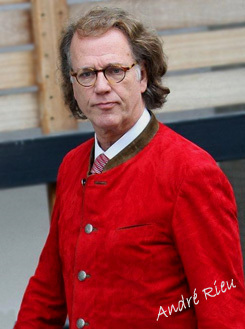 To be on the "safe side" André will be building a replica of the Vrijthof in case it should rain during the 2010 concerts. 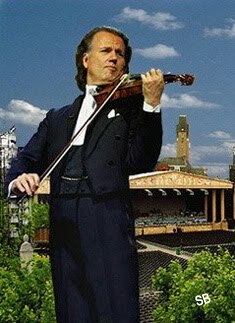 The violinist wants to use this decor in the MECC next year if the weather is inclement for his concerts on the square. Just barely four kilometers (about 2.5 miles) from the ancient Vrijthof, a copy of one of the most famous squares in the Netherlands is appearing. 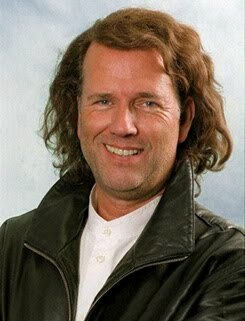 Responsible for this "architectural" masterpiece is André Rieu. 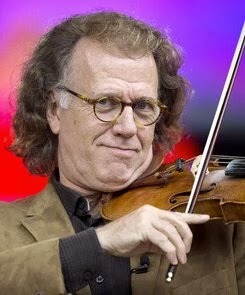 The world-famous orchestra leader has thought of a new stunt. 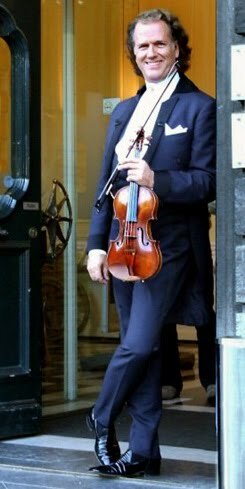 Before he and his famous Johann Strauss Orchestra depart on an icebreaker for the North Pole, the stand-alone violinist is first copying the square in the Maastricht Exhibition & Congress Center (MECC), so that the concerts will be covered. 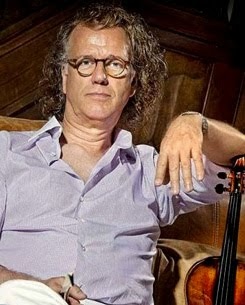 Since he tours around the world with an exact replica of the Viennese Schloss Schönbrunn, the bug has bitten the violinist. 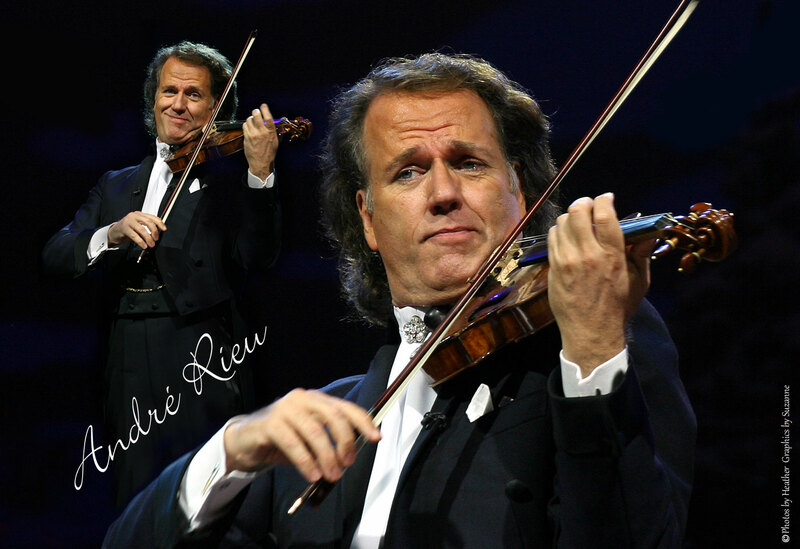 Since Rieu is such a perfectionist, he does everything possible to spoil his public as much as possible during his concerts. 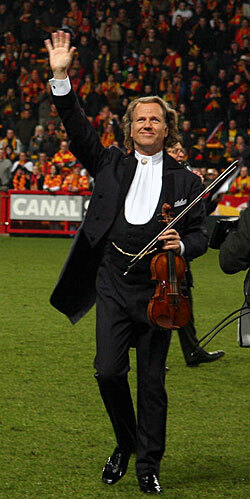 With his stadium filled shows, André Rieu very often performs in indoor arenas. 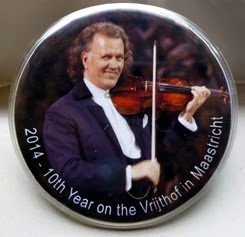 During his thirty year career he has been very lucky with the weather, conducting concerts in the open air. 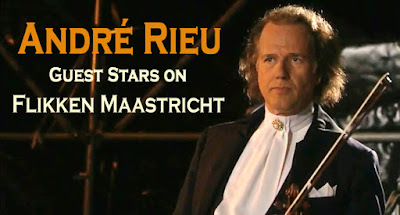 To be one step ahead of bad weather, Rieu decided that his concerts on the weekends of 9 to 11 July and from 16 to 18 July on the Vrijthof next year, can not be at risk due to weather. 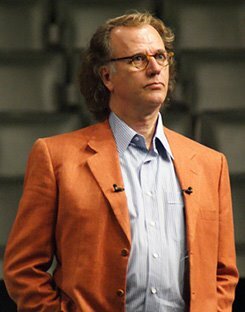 If necessary, he'll move the entire production to the largest hall in the MECC. 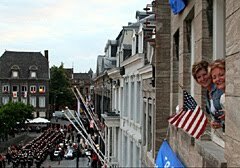 There is room for about ten thousand spectators, who - if they look around - will get to see the buildings around the Vrijthof, such as the many Cafes with dining capabilities, the Theater on The Vrijthof, the Spanish Government Building and the Churches of the St. Servaas and St. Jan. 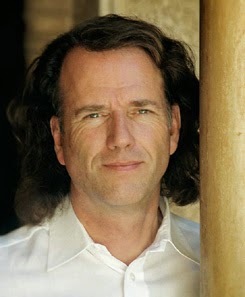 Wherever possible, Rieu wants the buildings to be three-dimensional and life size. 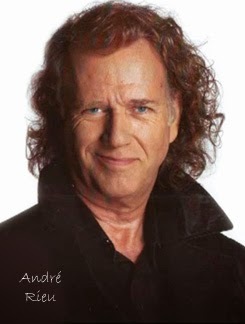 "You know André", says his press spokesperson Kerstin Cornelis. "The square should look exactly the same. Only the churches will of course not quite fit in the MECC. It is an expensive investment, but we plan to perform for many years to come on the Vrijthof, and we know there will be times when the weather will be bad. We'll have at least a good backup. 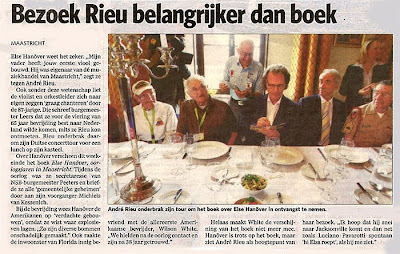 It is possible that in the future we may go on tour with the Vrijthof decor." 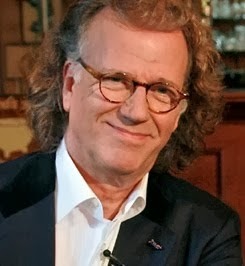 In case of bad weather, André Rieu wants to transport the visitors who use the eating arrangements on the Vrijthof, in free shuttle buses to the MECC. It is not inconceivable that the decor could also be used for the Christmas concerts in December next year in the MECC, which the orchestra leader is now starting to organise. 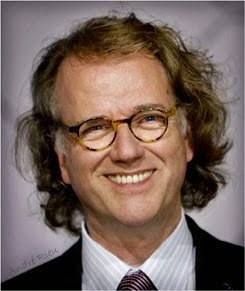 "That still has not really been discussed yet," said Cornelis. 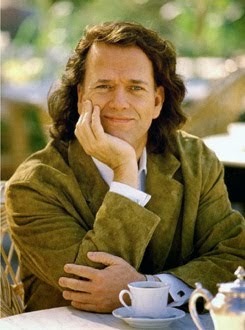 "Everything is possible in that regard. For now, however, we are focusing on current projects."